With the Life OK show Mahakumbh (Arvind Babbal Productions) coming to an end, the creatives are set to tie up all the loose ends. But the makers are not compromising on the twists and turns in the supernatural mytho thriller series. The viewers have already witnessed many a drama in the show, with Nagas capturing Shivanand (Manish Wadhwa) and Leela (Maya Salariya) helping Maya (Payal Rajput) by taking out poison from her body. And now, there are going to be some more twists with Maya getting kidnapped again. With this new development this will be interesting to see who will kidnap Maya and whether Rudra will risk his life to safe Maya? And whether the Garuda will be finally able to protect the Amrit or not? When we contacted Payal for a confirmation she refused to comment. No doubt that the Life OK show Mahakumbh (Arvind Babbal Productions) has been successfully managed to keep its audience glued to the television screen with its gripping storyline. Now dear fans, here comes some exclusive info about your favourite show. In the show, Rudra (Gautam Rode) and Charles’ (Azad Ansari) identity as two Garudas or the protector of the Mahakumbh has already been revealed and it’s time for two more Garudas to reveal about themselves. And guess who will be these two Garudas? Rudra if she would help him in fulfilling his mission. And for this reason she will blame herself and hold herself responsible for the demise of Mai Mui (Seema Biswas),” added the source. With the revelation of four Garudas in the show, we are pretty sure that the story will take some more interesting turns. We tried reaching Payal Rajput for a comment but she remained unavailable. Till then keep guessing who can be the next three Garudas. The buzzing streets of New York's Times Square saw the promos of Indian TV show "Mahakumbh- Ek Rahasya, Ek Kahani" being played out for a potential overseas audience. It is a case in point that while Indian television is growing out of kitchen politics and run-of-the-mill concepts, promotional activities are also getting bigger. The mytho-thriller, which airs on Life OK, was promoted at Times Square as well as few other parts of Manhattan, said a statement from the channel. The overseas campaign was executed with the support of 21st Century Fox, a conglomerate of Fox Star Studios, owned by Star Network. “Considering the storyline of 'Mahakumbh...', the show has a lot of references to an international conspiracy related to Mahakumbh, it was important for us to grab attention of our loyal and potential overseas audiences. “The promo was strategically screened on Times Square in order to reach out to the masses in one go. While 'Mahakumbh...' was our first attempt to gain worldwide presence, we will continue to focus on international markets in future as well for our upcoming shows,” a channel spokesperson said in a statement. "Mahakumbh.....", that went on air Dec 15, is a thriller about a boy who has supernatural powers. The gripping series features actors like Gautam Rode, child artist Siddharth Nigam, Seema Biswas, Payal Rajput and Manish Wadhwa. the audience and the show looks really promising. But, as we know, nothing can pay off well until a substantial amount of hard work and effort is put behind it. And what we hear from our sources is that the Mahakumbh crew is giving blood, sweat and also the happiness of celebrating during New Year, to the show. Readers, are you eager to know what we are getting at? Well, here comes some piece of info from the sets of Mahakumbh. The cast and crew of the show was busy shooting for a continuous stretch of twelve hours. And just after a break for one day, the entire crew resumed shooting. Our source revealed, “The crew started shooting from seven in the evening on December 30 and continued till seven in the morning next day. And just after a day off on December 31, the entire crew was back to work from the very first day of the New Year”. When we contacted Gautam Rode, the lead actor of the show, who is essaying Rudra, commented, “Yes we were shooting for a long time for the show, but in between I spent time with my family. And, I am definitely having fun while doing this show”. acclaimed Director turned Producer, Arvind Babbal. Yes, after the character played by Seema Biswas, Surekha’s character will be the driving force in the protagonist Rudra’s (Gautam Rode) life. She will be an aged woman, very positive who would guide him in every walk of life. The veteran actress who has been appreciated for her stellar performance as Dadisa in Colors’ long-running show Balika Vadhu will have a different look for Mahakumbh. Though her character name has not been coined yet, she will be a person who would be looked up at with all dignity by Rudra. When contacted, Surekha claimed that she is still in talks for the show, and there is nothing confirmed. However, our source confirmed to us that the lady will soon be seen entering the show in a never-seen-before avatar. The usual evening of prayers was made special for devotees at a ghat on the bank of the Ganga river here when Bhojpuri star Manoj Tiwari along with the cast of forthcoming TV show Mahakumbh - Ek Rahasya, Ek Kahani made the right noises about channel Life OK's new offering. It was more than just a regular Tuesday evening at the Dashashwamedh Ghat - with the fervour, the cheering and the smiles on people's faces. Apart from the hustle bustle before the evening Ganga aarti, visitors sensed something special was in store -- much with the huge posters of the show, floral arrangements as well as a team of 20 security men. Just then entered Gautam Rode, the actor whose popularity went up several notches with Saraswatichandra. He plays the protagonist Rudra in Mahakumbh. If teenaged girls ran with their mobile phones and screamed with excitement upon seeing their favourite 'Saras', the men in the crowd could easily recognise him via the Mahakumbh posters. Accompanied by his co-actors Payal Rajput, Robin Das and Manish Wadhwa, child actor Siddharth Nigam, and Life OK executive vice president and general manager Ajit Thakur, Gautam cut through the crowd to make his way to a boat. Just when the crowd couldn't get enough of his presence, entered Manoj Tiwari. Har har Mahadev -- the crowd chanted upon spotting Manoj, considered one of the biggest stars to emerge from Bihar. He was like Pied Piper with the crowd following him and not to one's surprise, joyfully danced to his tunes. Manoj not just belted out some traditional and devotional numbers on the ghat prior to the holy aarti -- a daily exercise involving multiple priests who conduct the proceedings using incense, multi-layered lamp stands and the sound of the temple bells; but also personally introduced each of the Mahakumbh members to the audience. He asked them to welcome and bless the show, which is also widely shot in Varanasi, considered India's oldest Hindu city. The show's lead actors Gautam and Payal also conducted an aarti before the main aarti began and engulfed the environs with the pious fervour of devotion that this holy land is known for. The evening ended with a boat ride in the winter chill. What remained was more curiosity for Mahakumbh, the story of an ordinary man with extraordinary powers. A contemporary mytho thriller produced by Arvind Babbal Productions, the show will go on air 15 December, 2014 and will see acclaimed actress Seema Biswas in a key role. TV actor Gautam Rode is going out of his way to perfect his look for the show "Mahakumbh" -- even if it means tanning his body naturally to match the requirements. Gautam is playing the protagonist Rudra -- a saviour and superhero -- in the show, which has been shot in various locations in India and abroad. Rather than going the usual way and using make-up, the actor got tanned naturally to avoid looking as fair as he is in real life. If one goes by the first poster of the show, Gautam has also worked very hard on his physique to get into his character. The show, which will go on air on Life OK starting Dec 15, will "unfold an unheard story of a legend with powers unmatchable". It is said to be an amalgamation of contemporary and period drama because even though the main setting is modern, it has excerpts of the past. Tellychakkar.com has always kept readers updated about Life OK’s upcoming show Mahakumbh which is produced by Arvind Babbal. 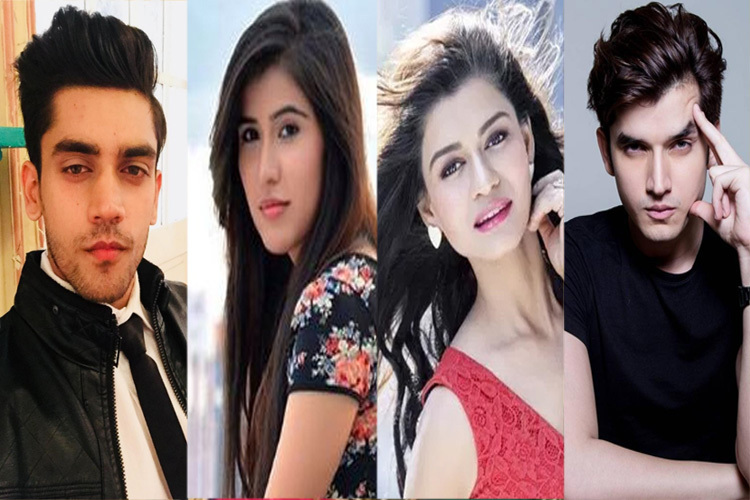 We had already reported about renowned actors namely Gautam Rode, Seema Biswas, Shruti Ulfat, Kulbhushan Kharbanda, Dhoom 3 fame kid Siddharth Nigam, Ketki Dave, Mary Kom fame Robin Das and Rajesh Shringarpure being part of the series. Now Tellychakkar.com has got information about an exclusive development in the show. Due to prior commitments Rajesh has moved out of the show and the talented Manish Wadhwa (Iss Pyaar Ko Kya Naam Doon…Ek Baar Phir) has been roped in to replace the actor. According to our sources the actor will portray the lead’s (Gautam) dad. The show has a very intriguing storyline with Gautam and some other characters having superpowers. Also with each characters connected with a back story, the show is said to be a one of a kind. The show is slated to air from end of this month.